5 in stock. More on the way this week. This item is in stock for next working day delivery to UK customers when you order by 4PM (16.00pm) Mon-Fri. Choose guaranteed next day delivery at checkout for next day delivery. Customers outside of the UK checkout for delivery rates. Orders placed after 4.00PM (16.00pm) on a Friday will be processed the next business/working day. The Apricorn Aegis Fortress 1TB USB 3.0 Padlock Encrypted Hard Drive With Pin FIPS 140-2 Level 3 is the perfect solution if you are looking for a portable padlocked HDD accompanied by huge storage capacity and in this case a massive 1TB. Aegis Fortress FIPS 140-2 Validated Drive, certified and tested to NIST FIPS 140-2 Level 2 requirements. Sporting an easy-to-use keypad that is impervious to dust and grit, super-tough integrated USB 3.0 cable, plus a software-free setup and operation, the Aegis Fortress enables you to access the drive simply and easily with your own unique PIN. With no software updates or ADMIN rights to contend with, this drive is a breeze to implement in corporate environments, and with on-the-fly 256-bit AES-XTS hardware encryption you know your data is safe 24/7. FIPS 140-2 Level 2 Validated. Tested and validated by the National Institute of Standards and Technology (NIST) for use by the Federal governments of the USA, Canada and others, the Aegis Fortress Drive is based on Apricorn's FIPS 140-2 Level 2 validated encryption module. The epoxy coated boundary includes all encryption functions and all Critical Security Parameters (CSPs) such as PIN storage, encryption key generation and storage, random number and seed generators, and all firmware storage. The FIPS module is a complete encryption system, and all CSPs never leave the boundary and are never shared with a host system. By design, the HDD/SSD that stores the encrypted data is excluded from this boundary to both maximize affordability and product line flexibility in capacity and form factor offerings. Additionally governments and public companies worldwide in the education, healthcare, and financial services industries have adopted using FIPS 140-2 validated drives as the regulations requiring their use is continuously expanding. Enterprises that wish to use the strongest encryption available have also adopted using FIPS 140-2 drives as it's widely known how stringent the testing is to receive this level of certification. Easy-to-use KeyPad, Software-Free Design and Ability to Work on ANY Operating System makes Corporate Deployment a Breeze. With an easy-to-use keypad design and software-free setup, the Aegis Fortress Secure Drive enables you to access the drive with your own unique PIN. The embedded keypad prevents hardware and software key logging attempts to capture your password entered via the host system. Software-Free Design – With no admin rights to contend with. Setup takes just minutes. With no software installation required for setup or operation and the ability to run on any platform, the Aegis Fortress provides stress-free deployments in all corporate environments. Independent Admin and User PINs. 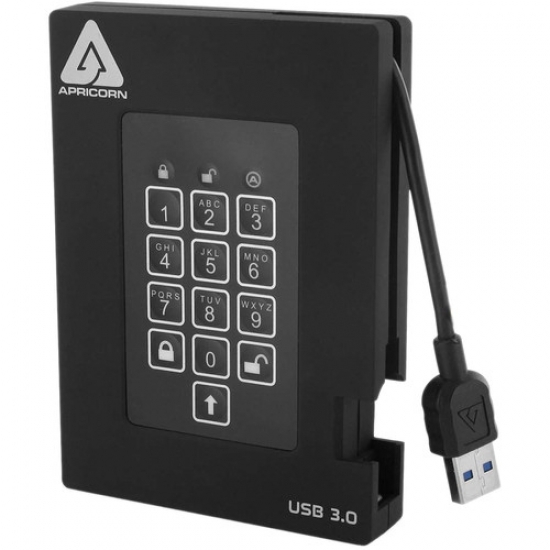 The Apricorn Aegis Fortress 1TB USB 3.0 Padlock Encrypted Hard Drive With Pin FIPS 140-2 Level 3 can be configured with independent Admin and User PINs. The Administrator Feature allows enrollment of up to five unique User ID's and one Administrator, making it a useful business collaboration tool. If the User forgets their PIN, the drive can be unlocked using the Admin PIN. With its Forced Enrollment feature, the Aegis Fortress requires you to create your own unique PIN at first use, ensuring a secure PIN from the get go. Create custom profiles and simultaneously set up multiple Configurator-compatible devices in a matter of seconds with Apricorn's Aegis Configurator / Powered Hub bundle. Independent User and Admin PINs. Establishing or changing the drive's settings can only be done in the Admin mode, using the Admin PIN for authentication. Further, up to four additional User PINs can be programmed to allow access to the data on the drive. The Aegis Fortress is shipped without a factory pre-set PIN meaning that in order for the drive to be set up and used, a unique Admin PIN must first be enrolled at the onset of the initial setup process. Once a device is configured by the Admin, additional User PINs can be generated by the Admin at that time, or it can also be deployed in a state of USER FORCED ENROLLMENT in which the User is required to establish his or her own User PIN before the drive can be accessed. Sealed from Physical Attacks by Tough Epoxy Coating. The internal drive components are completely enveloped by a super tough epoxy compound, making it virtually impossible to physically access without causing permanent damage to the electronics. The Aegis Fortress has two read-only modes; the first is enabled / disabled exclusively by the Admin within the Admin mode. The second read-only mode can be enabled or disabled by anyone with an enrolled PIN for that particular drive. Ideal for forensic applications where the drive's contents must remain intact and unaltered for later examination, or for when the drive is to be accessed by several people in a public setting. The Aegis Fortress automatically locks once it's unplugged from the computer's USB port, power to its USB port is interrupted, or after a pre-programmed period of inactivity. Designated for specific cases in which the drive needs to remain unlocked through USB port re-enumeration such as during reboot, or passing through a virtual machine. In the event that a User PIN is forgotten, up to 4 one-time use recovery PINs can be programmed to permit access to the drive's data by creating a new state of User Forced Enrollment. The Aegis Fortress also employs a useful drive reset feature, which can be implemented with a unique command. This clears all PINs and data, and creates a new randomly generated encryption key, enabling the drive to be reset and redeployed as many times as needed. After the programmed number of failed PIN entries has been attempted, the Fortress will assume it is under brute force attack and will destroy the encryption key and lock itself, rendering the data useless and requiring a total reset to redeploy the drive. Wear-Resistant Key Pad - IP56 Certified Water & Dust Resistant. Designed with protection in mind, the entire Aegis Fortress family incorporates ‘wear-resistant' keypads to hide key usage and avoid tipping off a potential hacker to the commonly used keys. Perfect for taking your data on the road, the Aegis Fortress's low powered design is perfect for using with notebooks and taking your data on the road. Perfectly pocketable, the compact, robust design features a convenient integrated USB cable, bringing connectivity at the flick of a fingertip. Super fast USB 3.0 Connection – Data transfer speeds up to 10X faster than USB 2.0. With USB 3.0 data transfer rates up to ten times faster than traditional USB 2.0 drives, the Aegis Fortress's super-fast performance is comparable to that of your computer's internal drive, enabling you transfer large files in seconds and quickly back up an entire system. The Aegis Fortress is also backwards compatible with USB 2.0 and 1.1 ports.